I often find myself reading Italian heritage recipes online and realizing that they probably do not hold true for my northern Italian family. Foods that are native to Sicily or Rome are not the same as what the Vittoriese would have eaten. I also did not have the blessing of spending time with Nonni at Easter, so I don't know for sure if they had the same tradition of making Easter pie as Rome or Florence, but I can guess at what they would do. Easter Monday is a strange holiday to Americans, but in my great-grandparents part of Italy it would have been celebrated with zeal (and still is!). Since they are so close to Austria and Hungary our area of Italy sometimes incorporates customs from there - like the dowsing of holy water in the morning to have your family wake up blessed on Easter Monday. But amongst the more pleasant traditions of Easter Monday is the making of the Easter Pie, known as a torta ricotta. Here's another of those interesting cases where depending on where you are in Italy, the more changes to the torta occur. Some have lemon, some do not. Some have a top, some do not. Some have lattice work on top, some do not. Even the sweet nature of the torta is changed in Sicily to a savory pie. The blessing of living just an hour's train ride from Venice meant to Serravalle, the village my great grandparents were from, had the benefit of expanded trade in foods. So getting a hold of a true Sicilian lemon (less acidic than Meyer lemons, more floral tasting) was not as big of a deal as say, a village up in the mountains far from transit. Truly rich people could also get Amalfitanos, lemons from the Amalfi coast that are sweeter and less acidic than Meyer lemons, but my family was not among that bunch of wealthy residents in town. My family also had the benefit of stone pine trees producing pine nuts (if they didn't have a tree of their own, Serravalle could easily import them from Pisa), and would cure raisins each year with leftover grapes from the wine harvest. I actually do know from interviews with my great-aunt and my dad that Nonni used to make her own wine, so this is not a stretch to believe that she could also produce raisins. A local mill produced flour of different types, a few chickens to have eggs, and a cow to produce milk and you've got pretty much all the ingredients you need to make a pie. With having celiac disease, making a torta with the original ingredients is impossible, because of the flour. However, Italians have great respect for those who have to do a diet "senza glutine" (gluten-free), producing pastas and flours galore to serve the needs of the celiac population across the world. So I made this pie gluten-free and feel it honors my ancestors well on this blessed holiday. 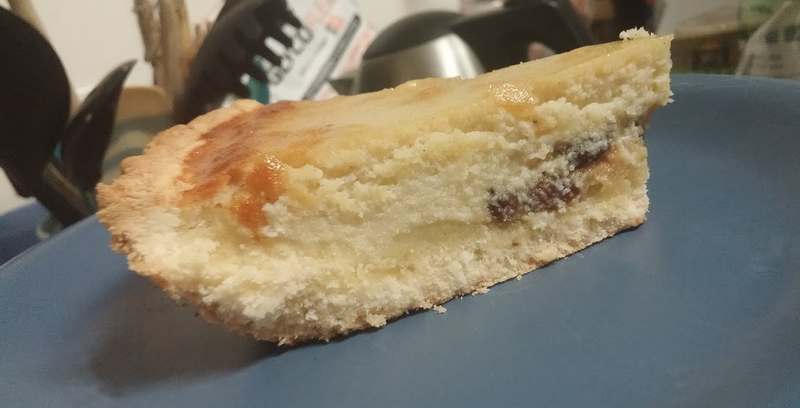 The crust turned out like a beautiful sugar cookie to the light and lemony ricotta, so I am very pleased with it. -Put the flour, the 100 gram portion of sugar, the butter, and the 2 egg yolks into a bowl and mix. The dough will become a sturdy dough ball that's soft to the touch. If you find it a little too hard, add some cold water to it. -Cover this bowl with plastic wrap and chill in the refrigerator for 30 minutes. -While the dough is chilling, mix the ricotta with the 150 gram portion of sugar, the 3 yolk portion of eggs, and a dash of cinnamon. Add the raisins and pine nuts. You should also add the grated lemon peel here. I like lemon flavoring, so I added the grated peel of an entire lemon, but you can adjust to your taste preferences. A little will brighten the mixture, a lot will give lemon flavor. -Beat your egg whites firmly to produce peaks. Depending on how well you beat them will produce the height of your pie. -Add the egg whites to the ricotta mixture gently. -Preheat your oven to 425 degrees F (220 degrees C / Gas setting 6). Here's where you can make another decision. My version pictured is the no top crust version. -No Top Crust instructions: grease a pie dish with nonstick cooking spray and place on a cookie sheet. Place the dough ball in the middle of the dish and gently pat out out to the sides and upward until you have a nice ridge on the dough above the dish. Pour the mixture into the pie dish. Cook between 35-40 minutes or until the filling shows it is firm. -Top crust instructions: divide the dough from the refrigerator into two parts. 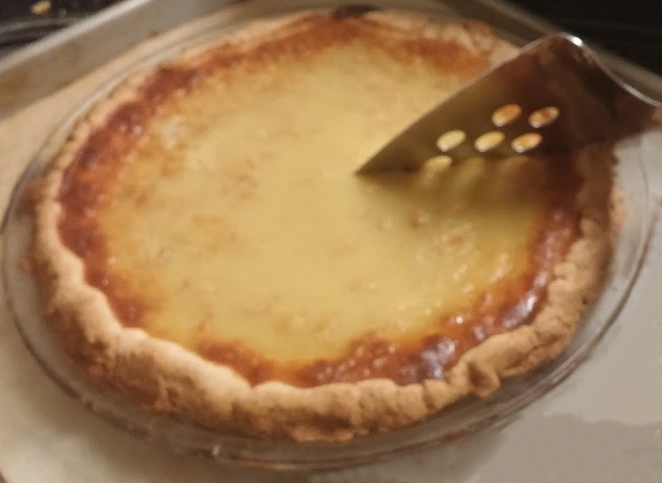 Grease a pie dish with non-stick cooking spray, and place one half of the dough at the bottom of the dish and pat out to the sides and upward until the just above the edge of the dish. Pour the mixture into the dish, and roll out the second ball of dough into a flat layer that can rest on top of your dish. Seal the edges with your preferred method (I like crimping) so that the filling won't leak out of your pie during cooking. Cook for 30-35 minutes until the dough is golden and the pie feels firm. Last step, cool and sprinkle with powdered sugar or icing sugar if you wish. Makes a pie big enough for 8 good sized slices. * = For those of you who aren't gluten free, you can use 300 grams of all purpose flour and increase the amount of butter to 150 grams. **= For those of you that are gluten free, King Arthur's flour I find best for sweet goods as it is fine in nature and performs well as a drier pastry. For those of you that want to make your own flour blends, Gluten Free on a Shoestring has a mock Better Batter (and mock Cup4Cup flour) that would also work amazingly well in this recipe. If you are dairy free as well you can use her recipe as well for pastry flour and it should work just fine. Facebook is full today of folks trying out J Paul Hawthorne's nifty new tool to map out where your ancestors were born (or died, or really whatever you want in common with them...). What comes out is a fun visualization of where your ancestors were from. 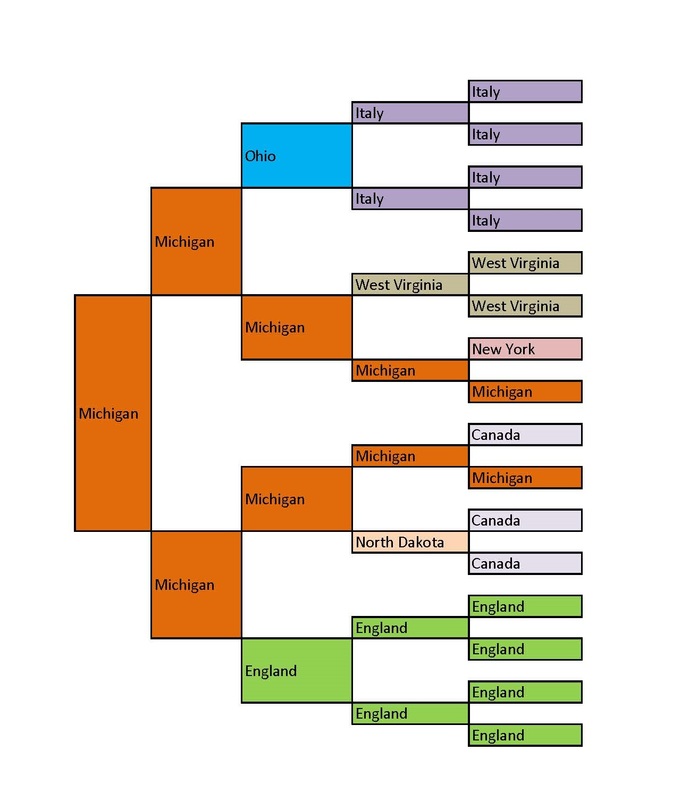 Yes, I know my maternal grandmother's ancestors were all English, but it was fun to put a color behind them and identify them so clearly as such. Interestingly, it didn't immediately make me think that my ancestors had diverse background. What it actually made me think of was a color chart for knitting designs, specifically, of Kaffe Fassett. I would have never thought those colors worked together, and yet somehow, they do. Its the mosaic of me! I can see them now, in mitered squares and abstract blocks, winding around a beautifully felted bag. My ancestors were a little rough around the edges, so felting makes a good way to represent them, sturdy and tough with a little wear and fuzz showing fragility.